• CONTROLLED DISCHARGE RATE The pump discharges approximately one (1) quart on every complete forward and backward cycle. 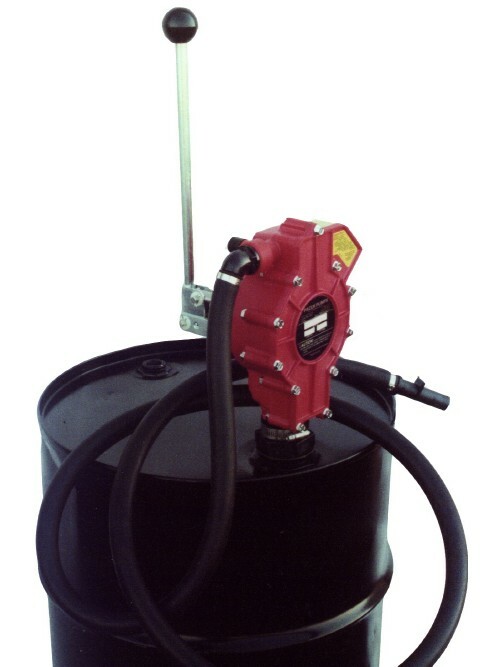 • DISCHARGE HEAD: Up to 25 ft.
• TWO POSITION PUMP HANDLE Handle can be mounted above the pump or below. • TAMPER PROOF HANDLE Can be padlocked to protect against unauthorized use. Designed for the transfer or dispensing of concentrates, additives or other liquids which are purchased in bulk but are used in small quantities. This low cost pump delivers one pint per stroke or one quart with the forward and back push/pull of the handle. The variety of materials of construction enables the user to select those which are specifically required for his individual needs according to chemical resistance charts. The use of this pump eliminates having to pour from one container to another and avoids costly and hazardous spilling and splashing.